I often ramble on about my desire to create fresh images but this is another view that I just never tire of. Perched above the West end of Yosemite Valley, the Tunnel View overlook draws hundreds of photographers each day. While it’s not often that you see an original image from this location it’s certainly not to be missed. This vantage is a bit different than the standard view but I’ve been sworn to secrecy over it’s exact location. I could tell you, but I’d have to…..
A classic view for a reason, this was the first location that we took the current workshop to. I thought that the wet granite and the blue reflection, from the sky, added interest and depth to the scene. To make the image I used my Canon 5D, and 24-70 lens at 28mm. To get adequate depth of field I set the aperture to f/11. There was a little more dynamic range than the camera could handle, so I brought down they sky with a Singh-Ray 2 stop graduated neutral density filter. While many would espouse the use of HDR imaging to handle the scene, I’d much rather correct it in the camera vs on the computer. 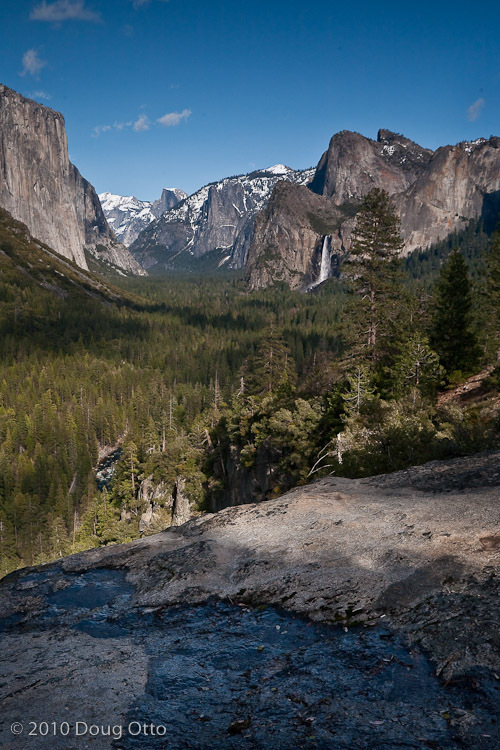 This entry was posted in Photography and tagged Canon 24-70 f/2.8L, Canon 5D, doug otto, Photography, tunnel view, yosemite, yosemite national park. Bookmark the permalink. I love your pix on this website. I googled you. Where should I send the pix of you on the rock, moving the debris downstream? Thank you for a GREAT workshop, I loved it. Thanks Donna. I enjoyed meeting you and really liked your poppy image. You can always reach me via my contact page: https://blog.binaryemulsion.com/wordpress/contact-me/ but I’ll shoot you an email as well.